...that don't cost a down payment on a house. 1. A duchesse satin mermaid gown by Truly Zac Posen. Get it from David's Bridal for $858-$908. Available in sizes 0-26W. 2. A crepe cold-shoulder dress with a sweetheart neckline and adjustable straps. Get it from Reformation for $388. Available in six colors, sizes 0-12. 3. This gorgeous bohemian two-piece dress with a French lace top and tulle skirt. 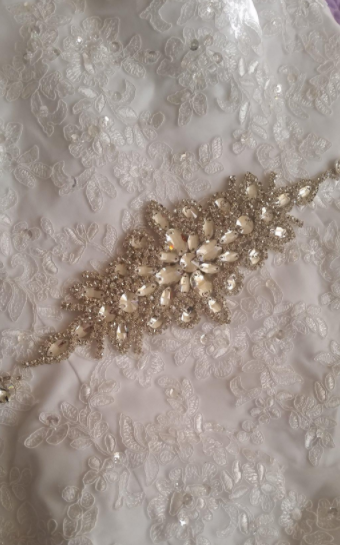 Get it from Jurgita Bridal on Etsy for $885. Handmade to order. 4. A simple shift with flouncy trumpet sleeves. Get it from Eloquii for $99.90. Available in sizes 14-28. 5. This Victorian long-sleeve lace gown with not-so-shy keyholes and a split skirt. Get it from Fame & Partners for $329. Available in sizes 0-22, in two colors, three lengths, and with three customization options (closed slit, closed keyhole, and knee-length skirt). 6. The quintessential mermaid gown with ruching, a sweetheart neckline, and a ruffled organza skirt. Get it on Amazon for $162. Available in sizes 2-26. 7. A one-shouldered blouson mermaid gown made of delicate beaded tulle. Get it from Macy's for $379. Available in sizes 2-16. 8. A romantic off-the-shoulder dress in champagne tulle. 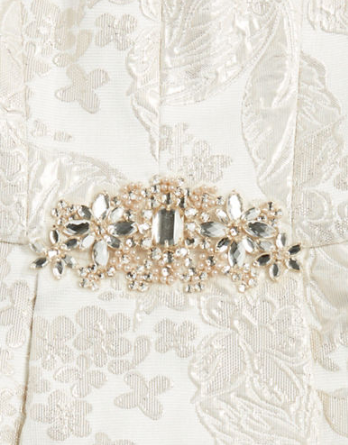 Get it from BHLDN for $1,300. Available in sizes 2-12. 9. A Kate Middleton–esque shift with a blouson top and form-fitting pencil skirt. Get it from Shopbop for $295. Also available in black, sizes XS-L.
10. A Marchesa Notte gown with a mermaid tulle skirt and rose gold lace appliqué. Rent it from Rent the Runway, starting at $130 (retails at $1,235). Available in sizes 0-12, in regular and long. 11. 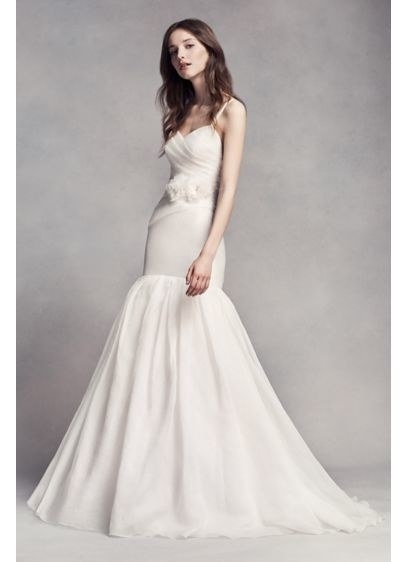 This ivory crepe gown with a crisscross bodice, off-the-shoulder sleeves, and a sweeping train. Get it from BHLDN for $900. Available in sizes 0-14. 12. A strapless A-line dress with a belt embellishment and lace overlay. Get it on Amazon for $109+. Available in ivory and white, sizes 2-26. 13. A multi-texture bohemian two-piece set for a beach or summer ceremony. Get the top for $190 and the skirt for $280, both from BHLDN. Available in one size. 14. 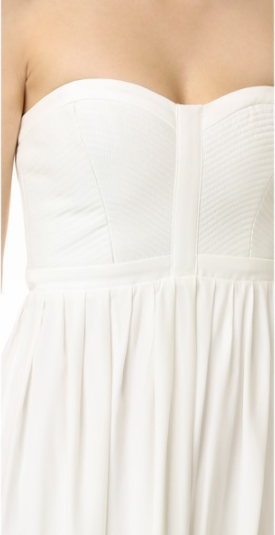 A simplistic strapless silk dress with a bustier top. Get it from Shopbop for $298. Available in sizes 0-12. 15. A lace and tulle gown with floral sequin embellishments and a button-down back closure. Get it from AlexVeil Bridal on Etsy for $720. Handmade to order. 16. A gorgeous illusion scoop-neck ball gown with lace appliqué and a train fit for a queen. Get it on Amazon for $168. Available in three colors, sizes 2-26. 17. 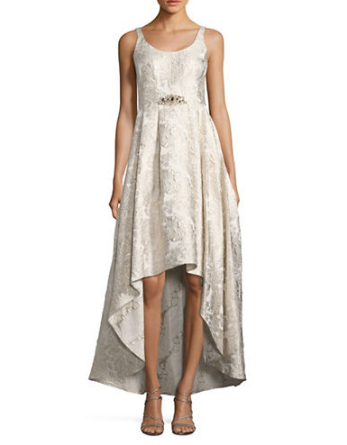 A brocade hi-lo gown with a scoop neck and waistline embellishment. Get it from Lord & Taylor for $269. Available in sizes 4-14. 18. A romantic dress with a fitted bodice of hand-sewn corded lace. 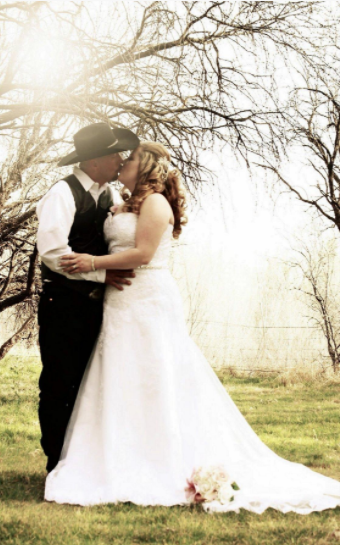 Get it from Milamira Bridal on Etsy for $690. Available in gray and white, all white, or white with custom color. Handmade to order. 19. An ivory A-line gown with a beaded lace bodice and swag sleeves. Get it from David's Bridal for $549. Available in white and ivory, sizes 16-24. 20. This silk-chiffon saree covered in intricate floral beadwork. Get it from Net-A-Porter for $2,295. Also available in white, sizes S-L.
21. A White by Vera Wang dress with a low back and trumpet skirt. Get it at David's Bridal for $898. Available in sizes 0-14. 22. A fitted trumpet-hem maxi that you can jack up with a belt or statement jewelry. Get it from Asos for $301. Available in sizes 0-14. 23. A gold lace princess dress with an illusion sweetheart neckline and a full tulle skirt. Rentals start at $105 (gown retails for $1,395). Available in sizes 0-12, in regular and long. 24. A silk charmeuse dress with crystal-encrusted straps and a long lace train. Get it from Fame & Partners for $849. Available in sizes 0-22, in three lengths, with three customization options (remove lace train, remove silk train, and remove crisscross from straps). 25. A ruffled off-the-shoulder gown with a soft flared skirt and train. Get it from Nordstrom for $360. Available in sizes 0-12. 26. A Nha Khanh crewneck dress with angelic lace and structural ribbon detailing. Rentals from Rent the Runway start at $95 (retails for $945). Available in three lengths, sizes 0-22. 27. And this Art Deco–era champagne and ivory gown with a beaded blouson tulle overlay and beautiful flowing train. Get it from BHLDN for $2,000. Available in sizes 2-16.